M. Reed, Introduction. H. van Houten, C.W.J. Beenakker, and B.J. van Wees, Quantum Point Contacts. G. Timp, When Does a Wire Become an Electron Waveguide? M. B*aduttiker, The Quantum Hall Effect in Open Conductors. W. Hansen, J.P. Kotthaus, and U. Merkt, Electrons in Laterally Periodic Nanostructures. Chapter References.. Index. 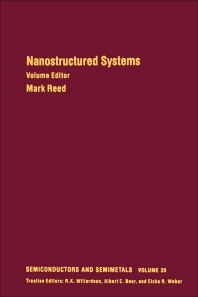 This is the first available volume to consolidate prominent topics in the emerging field of nanostructured systems. Recent technological advancements have led to a new era of nanostructure physics, allowing for the fabrication of nanostructures whose behavior is dominated by quantum interference effects. This new capability has enthused the experimentalist and theorist alike. Innumerable possibilities have now opened up for physical exploration and device technology on the nanoscale. This book, with contributions from five pioneering researchers, will allow the expert and novice alike to explore a fascinating new field. Condensed-matter physicists, electrical engineers, and materials scientists.